Hello and welcome to the 40th installment of the SWD. Yesterday’s reports about capture of Deir Hafer were premature and false, city is still besieged and free from IS but SAA didn’t enter yet. It is unknown why or what is SAA waiting for before entering the city, the most plausible explanation could be that SAA is waiting for sappers, maybe even Russian ones since Deir Hafer is probably littered with IEDs left behind by retreating IS fighters. After the capture of Deir Hafer is finally officially announced, SAA‘s next goal in east Aleppo governorate should be Jirah airbase and then consequentially Maskanah, last IS stronghold in the governorate. Remaining SAA Tiger Forces in Aleppo advanced today northeast of Deir Hafer and captured Rasm al-Fallah in direction of Jirah airbase. Two days ago there were reports about SDF fully capturing Tabqa dam, those reports similar to Deir Hafer ones previously mentioned were premature and false. IS released footage proving that they still hold south part of the dam, this means that SDF currently holds two thirds of the dam at most, however, full capture by SDF is only a matter of time. 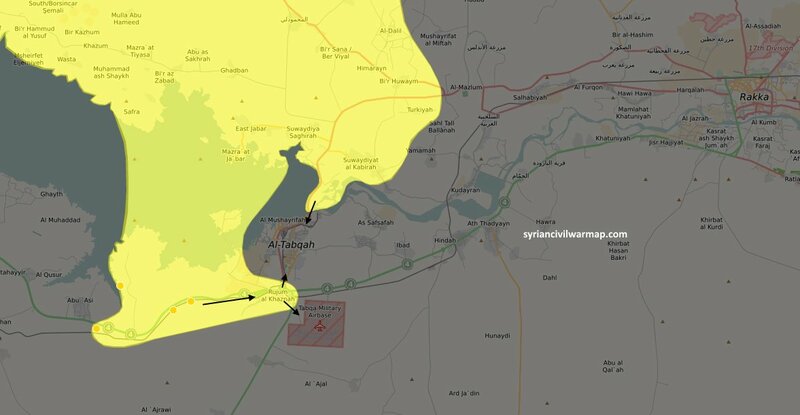 South of Tabqa, SDF captured Rujum al-Khazanah and are clashing with IS around the Tabqa airbase. SAA‘s counterattack launched yesterday in the evening was exaggerated and several localities falsely reported as captured. Most pro-government sources agree that Kawkab and Shayzar were recaptured but that too remains to be seen and confirmed with footage. Ahrar al-Sham and Faylaq al-Sham launched their own offensive in Northern Hama on Kernaz axis, early on they captured Tell al-Sakhr but after that things stalled a bit. Pro-rebel sources claimed control of Buraydij Hill, Buraydij military camp & al-Makatib checkpoint and pro-government sources claimed the attacks on Kernaz axis were repelled, as always we will just have to wait and see what is the truth. Military vehicles given by Turkey to TFSA were spotted on their way to Hama to assist the ongoing rebel offensive. This move may be Turkey’s response to Russia’s recent positive rapprochement towards SDF which Turkey sees as its enemy. Turkish President Recep Tayyip Erdoğan stated earlier that Turkey is saddened by the interest both Russia and US show in SDF so this could be Turkey’s reminder to Russia that they can resume actively supporting rebels in Idlib even with military vehicles given to TFSA. Unconfirmed report shared by pro-rebel sources claims that around 70% of TFSA located in Al-Bab were sent to Hama as reinforcements. HTS supported by other rebel groups launched another attack on Qomhana, three SVBIEDs were used in the battle. Heavy clashes took place throughout the day and rebels were allegedly able to enter the city but were quickly encircled and neutralized. Commander of Tiger Forces Suheil al-Hassan led today’s operation against rebels in Qomhana, however, several pro-rebel sources continue to claim that rebels took half of Qomhana , this seems unlikely as we would’ve already seen some footage from the city but I guess we will just have to wait until fog of war clears itself. Situation finally cleared in Industrial district between Qaboun and Jobar and it doesn’t look good for the rebels. According to the recent video and statement by Syrian Ministry of Defense SAA recaptured all areas lost during the offensive launched by rebels. 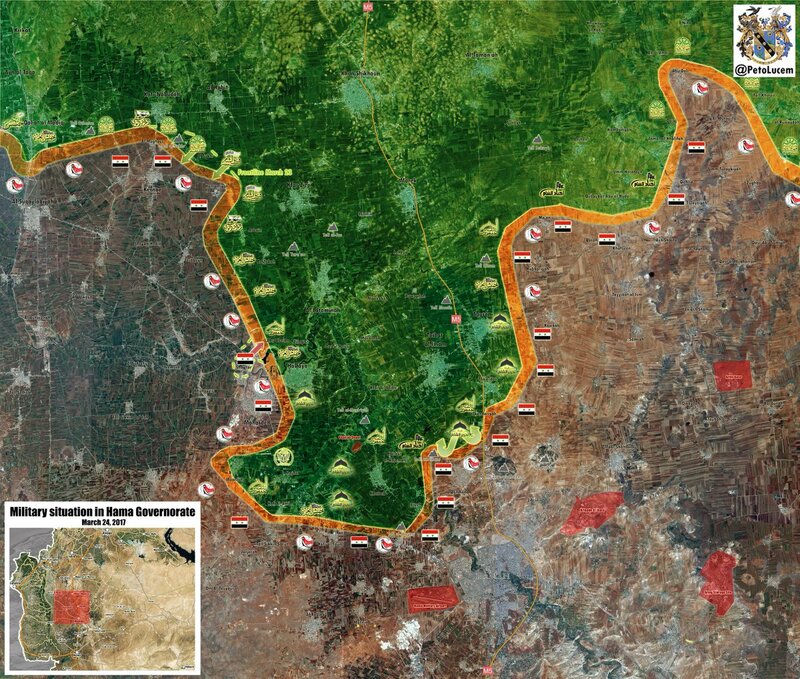 Several government sources allegedly claimed that the number of killed rebels in this failed offensive is more than 500. Even though this number doesn’t seem realistical and is probably much lower, casualties rebels suffered come at a very high cost considering they are besieged, have limited manpower & resources and their big offensive to link with Qaboun has failed so far. In the long run rebels made SAA‘s job at clearing East Ghouta easier (if nothing unexpected happens) by launching this borderline suicidal offensive. IS launched two desperate attacks across the Iraq today in hopes of distracting Iraqi Army from west Mosul, PMU were able to repel both of the attacks. First attack was launched from Hawija pocket on Gerdaghly village near Amirli, Salah al-Deen governorate. Second attack was bigger and much closer to Mosul, IS forces located in Tal Afar pocket attacked PMU positions around Tal Afar airbase, it took PMU three hours to completely repel the attack. On the 23rd of March 2017 CJTF-OIR has conducted 8 strikes in Syria. CJTF-OIR‘s main focus in Syria at the moment is Deir al-Zour-Raqqa region where they did 8 strikes supporting SDF‘s operation against IS destroying two tactical vehicles, a fighting position and a heavy transport equipment piece; and damaged four supply routes.